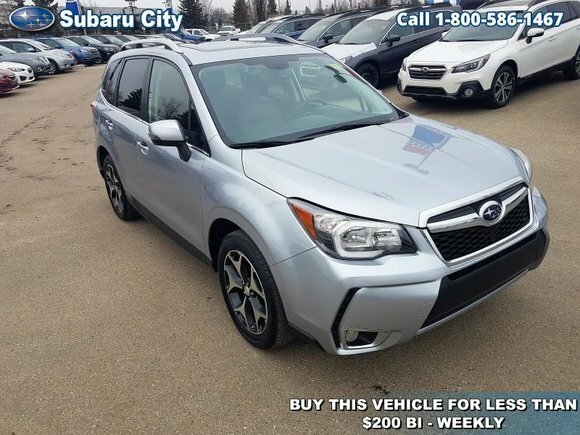 Home > Used Vehicles > 2015 Subaru Forester 2.0XT Limited,TURBO,NAVIGATION,WINTERS AND SUMMERS,LEATHER,SUNROOF,AWD,FULLY LOADED,LOCAL TRADE!!!! 2015 Subaru Forester 2.0XT Limited,TURBO,NAVIGATION,WINTERS AND SUMMERS,LEATHER,SUNROOF,AWD,FULLY LOADED,LOCAL TRADE!!!! Low Mileage, Sunroof, Heated Seats, Bluetooth, Aluminum Wheels, Air Conditioning! Hurry on this one! Marked down from $29900 - you save $1000. This 2015 Subaru Forester is fresh on our lot in Edmonton. This Subaru Forester is inspired to do more. Outstanding versatility thanks to a roomy interior and standard all-wheel drive, great fuel economy, and an impressive safety reputation make this Forester a favorite when it comes to pursuing your passions with those you care about the most. This low mileage SUV has just 42081 kms. It's ice silver metallic in colour. It has an automatic transmission and is powered by a 2.0L H4 16V GDI DOHC Turbo engine. This vehicle has been upgraded with the following features: Sunroof, Heated Seats, Bluetooth, Aluminum Wheels, Air Conditioning. It may have some remaining factory warranty, please check with dealer for details. Buy this vehicle now for the lowest bi-weekly payment of $188.91 with $3118 down for 84 months @ 5.99% APR O.A.C. ( taxes included, $790 Administration and Secure Ride included / Total cost of borrowing $6324 ). See dealer for details. Want to try the 2015 Subaru Forester 2.0XT Limited?